In Masanobu Fukuoka's last major work, Sowing Seeds in the Desert, the earth is in great peril due to the corporatization of agriculture, the rising climate crisis, and the ever-increasing levels of global poverty, starvation, and desertification on a massive scale. This present condition is not "natural," according to the late farmer and philosopher, but a result of humanity's destructive actions. Our global trauma, however, can be remedied, and maybe even reversed, but only when we change our methods of earth stewardship, and the very way we think about the relationship between humans and nature. Fukuoka's inspiring and international best-selling book, The One-Straw Revolution (1978), spoke directly to the growing movement of organic farmers and activists seeking a new way of life. For years after its publication, Fukuoka traveled the world spreading his teachings and developing a devoted following of farmers seeking to return to the truth of nature. Sowing Seeds in the Desert, a summation of those years of travel and research, is Fukuoka's last major work, and perhaps his most important. Fukuoka spent years working with people and organizations in Africa, India, Southeast Asia, Europe, and the United States, to show how you could grow food and regenerate forests with very little irrigation in the most desolate places. This revolutionary book presents Fukuoka's plan to rehabilitate the world’s deserts and achieve global food security by using natural farming, including practical solutions for feeding a growing human population and providing a deep and renewed understanding of the relationship between human beings and nature. Fukuoka’s message comes at a time when people around the world seem to have lost their frame of reference, and offers us a way forward. 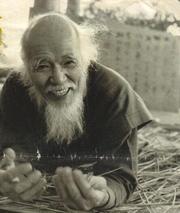 Masanobu Fukuoka (1913–2008) was a farmer and philosopher who was born and raised on the Japanese island of Shikoku. He studied plant pathology and spent several years working as a customs inspector in Yokohama. While working there, at the age of twenty-five, he had an inspiration that changed his life. He decided to quit his job, return to his home village, and put his ideas into practice by applying them to agriculture. In 1975 he wrote The One-Straw Revolution, a best-selling book that described his life's journey, his philosophy, and farming techniques. This book has been translated into more than twenty-five languages and has helped make Fukuoka a leader in the worldwide sustainable-agriculture movement. He continued farming until shortly before his death in 2008, at the age of ninety-five. This event is co-sponsored by ReSources and Transition Whatcom. Larry Korn, editor of Sowing Seeds in the Desert, is an American who lived and worked with Masanobu Fukuoka on his farm for more than two years in the 1970s. He is the translator and editor of Fukuoka's first English-language book, The One-Straw Revolution, and accompanied Fukuoka on his visits to the United States in 1979 and 1986. Korn studied Chinese history, soil science, and plant nutrition at the University of California, Berkeley. Korn currently lives in Ashland, Oregon, giving workshops and classes on natural farming, permaculture, local food production, and building resilient, sustainable communities. Masanobu Fukuoka is currently considered a "single author." If one or more works are by a distinct, homonymous authors, go ahead and split the author. Masanobu Fukuoka is composed of 6 names. You can examine and separate out names.